HDP's massive election rally in Istanbul, May 30, 2015. Demotix/ Sahan Nuholglu. All rights reserved.On April 11, the PKK and the Turkish military engaged in the first major clash since the beginning of the much-awaited and short-lived ceasefire of 2013, leaving 5 PKK militants dead and four Turkish soldiers injured. This clash, viewed as “pre-planned and fake” by the HDP, shows how taut the political situation is in the run-up to the general elections. HDP co-chair, Selahattin Demirtaş has accused the government of initiating ‘dirty games’, and Erdoğan has countered in kind by accusing the PKK of “trying to pressure people to vote for the HDP”. The increased salience of the People’s Democracy Party (the HDP) in Turkish domestic politics will be a wild card in the June elections. Previously a highly marginalized party predominantly aimed at ensuring and protecting Kurdish rights, in recent years (and particularly since Gezi Park), the HDP has begun to appeal to a much broader spectrum of Turkish society, and has finally entered into the normative battle taking place over Turkey’s public sphere as one of the main runners in what is now a four party race. Controversially in this year’s elections, the HDP will run as a party in their first attempt to break Turkey’s punitive electoral threshold in 13 years, which currently stands at 10 percent - the highest in Europe. In order to achieve this formidable task they will need to pull support from both the ruling party (the AKP) and from the main opposition party (the CHP). This was previously assumed to be impossible due to the enduring animosity bordering on xenophobia between nationalists (particularly Kemalists) and Kurds. But now it seems to be a viable goal. The widened appeal of the HDP can be attributed in no small part to a successful re-branding campaign. More commonly known by their nom de guerre; the BDP (Barış ve Demokrasi Partisi), they have decided to run under the western front of the HDP, perhaps due to the association amongst some sections of society between the BDP and the outlawed Kurdistan Workers Party (the PKK). Whichever way you look at it, this is a departure from the party’s ethnic-based political history. It also signals a swing in geographical focus, away from the party’s traditional roots (and electorate) in the Kurdish dominated south-east of the country (these votes are largely secure) toward the west - aiming to collect leftist or liberal voters disenchanted with the nationalism and conservatism of the main political parties. The success of Demirtaş in the presidential elections, during which he received nearly 10 percent of the national vote, shows the increasing ability of the HDP to do precisely this. The HDP has assimilated Gezi's oppositional message down to their insignia; a tree. Presenting itself as a party representative of all marginalized sections of society; from LGBT groups to environmentalists, the HDP now appeals to a much larger electorate than was previously thought possible in such a historically monocultural society. Demonstrative of a changing attitude in Turkey were the solidarity protests organised after soldiers attacked a Kurdish demonstration in Lice, an unprecedented show of moral outrage and support for Kurds suffering state violence. By contesting this, citizens actively began to redefine the meaning and practice of citizenship in Turkey, forming new alliances based on an eroded form of nationalism. A kind of symbiotic network of unlikely quotidian allies formed during and since Gezi Park, in self-defence against the authoritarian cultural homogenization of the private and public spheres. They began to develop into the sort of cohesive movement once designated by Raymond Williams as “the emergent” – a movement united purely in contradistinction to the hegemonic 'other'. This cohesion is what has been seen in recent events (particularly the debates surrounding the AKP’s controversial and draconian ‘security reform package’) and during the pre-election fervour. The rise of the HDP has seen the party’s political message resounding more throughout society, particularly among the Gezi youth with whom the message of democracy, freedom, pluralism, LGBT, worker’s and women’s rights resonates strongly. At the same time there have been internal transformations within the party itself in the attempt to become a more viable opposition. But in addition there is this factor of an anti-Erdoğan (emergent) coalition brought about by Gezi Park and the events that followed. As Nabi Avcı stated in the early days of Gezi, “We have succeeded in five days in doing something that the opposition wouldn’t have been able to do in years. And we have made very different segments, groups and fractions meet each other under the dust who would never have gotten together under normal conditions.” This remains as true today as it was then. The HDPs new support base is the product of a breakdown in the ideological ghettoization and atomization of Turkish society, combined with a corresponding rise in centralization and authoritarianism within its executive branch. This change was further compounded by a widespread realization that the traditional opposition parties (the CHP and the MHP) do not have the capacity to counteract or really challenge the AKPs unilateralism, and subsequent disillusionment with the traditional political process of strategic voting and hereditary partisanship. 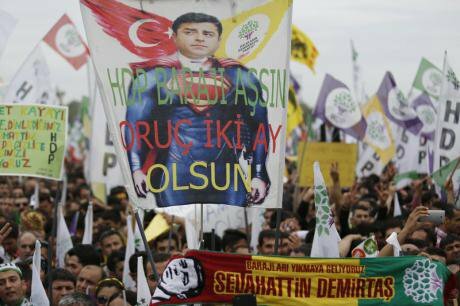 As such, the HDP is attempting to fill the post-Gezi vacuum and collect the votes of the disenfranchised and disaffected, particularly appealing to those with the left affiliations common amongst Turkey’s liberal youth. This new appeal to non-Kurdish voters may become a gateway to a new form of social democracy, allowing for the emergence or strengthening of alternative but complementary claims over identity, rights and meta-social visions, unified against the perceived authoritarianism of Turkey’s main centrist and rightist parties. How happy is the one who says I am Turk? This inclusivity transforms Turkey, normatively and discursively, and may well yield interesting results during the election. Additionally, the HDP is the only party in Turkey, and one of the few in the world, boasting near gender equality, with 40 percent of their parliamentary committee intended to be women. The HDP is also the only party in Turkey with openly LGBT representatives. Haltice Altinisik, HDP deputy chairwoman further summed up their ideology; “even if we are perceived as a pro-Kurdish party, look around here.We are also pro-women, pro-Alevi, pro-Christian, pro-Muslim and pro-peace. When you listen to Demirtaş, I believe you hear he is also in support of the working class, the oppressed. So being a Kurd is just one of the identities around you. We aim to unite the left in Turkey.” Essentially, the HDP can be seen as a party bringing about a new era in Turkish politics where pluralism is more than an empty discourse but an inclusive practice. On the road to peace? The HDP’s role in the ongoing and fragile peace-process with the PKK has given them unique leverage over the AKP (and thus greater credibility within society), which most recently manifested itself during negotiations over the security bill. Whilst the AKP appeared immune to the traditional opposition’s attempts to block the bill, the HDP were able to pressure them to negotiate amendments on 16 key points of the bill, and later able to ensure that the remaining articles were subject to committee review and revision. Their current sway over an otherwise unrestrained regime highlights just how risky the HDPs strategy is however. If their gamble fails, Kurds, as represented by the HDP, will be without any leverage and representation in parliament and the peace-process could quickly unravel. This could well spark widespread social unrest in the south-east which, thanks to the security bill, will subsequently be subject to even greater police and military repression. Furthermore, although the HDP and the PKK have received a boost in prestige, both due to their participation in the peace-process and the Kurds success against ISIS in Kobane, neither of them can claim a monopoly of control over their communities. The restless (and oft reckless) young nationalists and radical Islamic groups such as Kurdish Hezbollah, may well take matters into their own hands should the HDPs democratic gamble fail to pay off. The results of this were already visible during October 2014, when clashes left 50 dead and hundreds injured during protests over the AKP’s Syria policy. Without a legitimate political outlet for such angst, civil unrest could increase and the violent separatism of the 90s could resume. Is it over-dramatizing to argue that the fate of Turkish democracy hangs in this balance? Should the HDP fail to surpass the ten percent electoral threshold their seats will be given to the next biggest party, the AKP, and Erdoğan will certainly achieve the 400 seats in parliament he needs to drastically re-order the political system and create an executive presidency, prolonging and entrenching his control. This would have numerous socio-political ramifications, not least of which is the consolidation of power in the executive branch. Then there is the further marginalization and repression of Turkey’s ‘other’ 50 percent. Should they succeed however, the AKPs now 13 year single-party rule could come to an end, resuming Turkey’s previously long-standing tradition of unstable coalition governments. The final option foresees the return of the AKP, but as a weakened party without the potential to either radically restructure the executive or to unilaterally change the constitution. Survey data so far seems to indicate the latter option to be the most likely, revealing small but important fluctuations in voting trends in western Turkey, particularly in Istanbul where Kurdish and leftist communities are strongest. There have been further and more dramatic fluctuations in some of the country’s ethnically diverse eastern provinces, particularly those suffering the detrimental effects of the AKPs chaotic Syria policy such as Hatay and Gaziantep, draining votes from the AKP and distributing them primarily to the HDP and the MHP. The MHP with their strong nationalism, and the aggressive secularism of the CHP may attract more votes, but only from one corner of Turkey’s multi-polarized society, marginalizing and excluding others. The stale and lifeless principles of these two opposition parties and their attempts to preserve an archaic established order loses out in comparison to the policies and narratives of the HDP or even the AKP, who present a grandiose dream of change, of a ‘new’ Turkey, albeit from opposite ends of the social spectrum. Unlike the other parties however, the HDP has a unifying rather than a divisive or fear-based narrative and thus has the capacity to draw votes from a much broader spectrum of society, which although fewer in number, gives the party greater legitimacy as a whole. Legitimacy has been a crucial and lacking concept in Turkish politics in recent years, an issue which has achieved particular salience since Gezi Park. Should the HDP lose and the AKP come out strengthened, the legitimacy crisis facing the incumbent government, and particularly the infamously divisive President Erdoğan, may further entrench ideological schisms in an already dangerously divided society. Therefore HDP success is important not only for the Kurds or the leftists, it is crucial for maintaining some semblance of unification in a highly fragmented patchwork-society. Essentially, the HDP are the material holding together Turkey’s frayed social fabric, without which the social contract which binds state and society, ruler to ruled, could disintegrate. And the consequences of that, for stability, democracy and human rights, would be dire. Gareth Jenkins, The HDP's Election Gambit and Turkey's Tolling Alarm Bells, Turkey Analyst, vol. 8, no. 2. 2015.